So I’ve been a been quiet for a while. Food stuff has been happening but so has a mountain of course writing. After diving in the deep end of teaching Graphic Design and writing my own course from scratch, blogging has had to take the back seat for a while. Something’s gotta give, right? Wonderwoman could do it all. I’ve been channeling her with vigor and the results have been sporadic but the course has kicked along and that’s really the main focus for the moment. Meanwhile, the food happenings have been nutritious, luxurious, quick, laborious and all things in between, so I do have a bit of a stockpile of kitchen adventures up my sleeve to catch up on and with the weather as it is I’ll hopefully have plenty of time by the fire (read heater – fire sounds so much more writery romantic though doesn’t it?) to get everything I’ve been up to down in cyberspace. 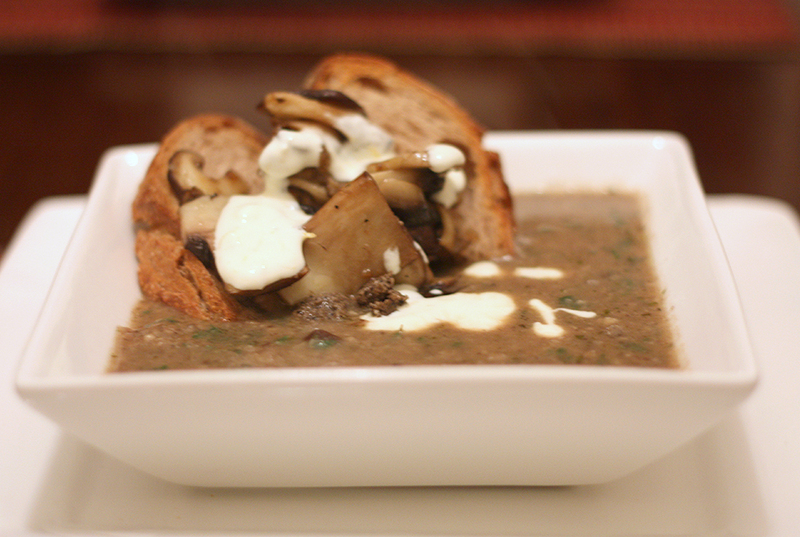 This mushroom soup was adapted from a Jamie Oliver recipe. I must admit I’m not a massive fan but I do find the odd recipe that’s a good source of inspiration from him. I also have a giggle about his, ‘dash of this’, ‘handful of that’ because I have trouble being precise about my ingredients a lot of the time. To a heavy based soup pot add a good couple of pours of olive oil then add fresh mushrooms (except the ones set aside). Stir for 1 minute then add garlic, onion and thyme. Once it starts to sweat add the porcini and liquid. Cook for about 20 minutes on a medium to low heat. Season to taste then add stock. Bring to the boil then simmer for about 20 minutes. Remove half from heat and blend to a puree then add back in. Meanwhile add a dash of olive oil to a smaller pot of pan and sautée the rest of the mushrooms. Add the zest and juice of half a lemon to a couple of tablespoons of greek yoghurt. Add the parsley to the soup, stir then serve with a couple of slices of toasted good quality bread, the sautéed mushrooms, a dash of truffle paste and the yoghurt mixture.